In 2018, Invisible Borders Trans-African project will embark on the 8th edition of its artistic Road Trip Project. The Road Trip this time, will be a Trans-African one encompassing countries, towns, villages, and Trans-African highways between Lagos (Nigeria) and Maputo (Mozambique) within a period of 95 days, from August 20 to November 23, 2018. In considering this route from the Western region, through the Central and Eastern Africa to the South, the above words by James Baldwin serve as a potent anchorage – a mind frame so to speak – for the participating artists consisting mainly of photographers, writers, historians, filmmakers from Africa and the Diaspora. As has been the methodology throughout previous editions of the Invisible Borders Trans-African Road Trips, the artists will once again employ their body as active-thinking bodies, in the negotiation of borders as much as in the re-imagination of histories embodied by this trajectory. Through everyday tangible encounters with stories, events, and happenstances indicative of lives both on the road and at border intersections, the artists absorb experiences that are further processed and articulated through their respective medium of expression and shared on the go, both directly with those encountered and virtually, through a dedicated website blog. From Nigeria to Mozambique, not only will the artists be tracing routes and rivers of great historical junctures – dating as far back as the pre-medieval migration/expansion of the Bantu peoples, and down to events of Eurocentric explorations and discoveries for which the continent was once derogatorily termed “the heart of darkness” – they will equally find themselves meandering the crevices of present-day fallout of arbitrary border demarcations as evidenced in inter-ethnic, inter-country conflicts. 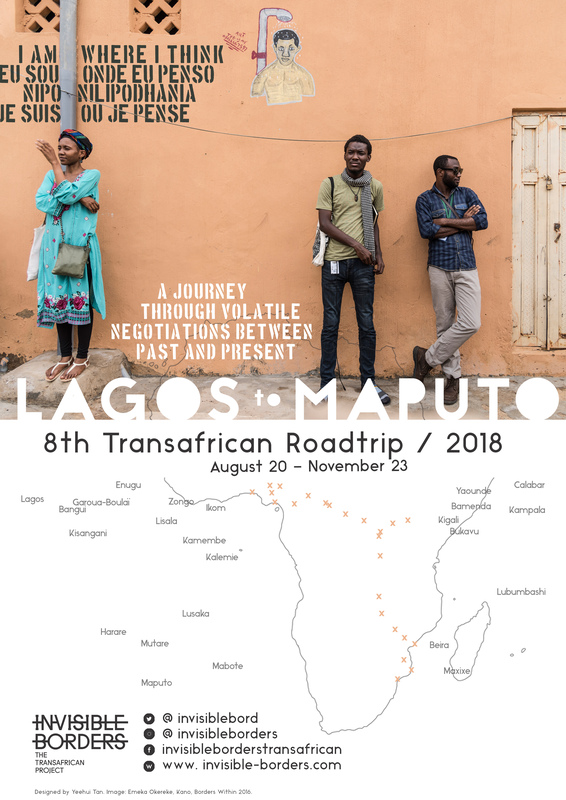 As such, the Lagos – Maputo Road Trip – framed by the Atlantic and Indian ocean – is a proposal to enter the interstices of a volatile negotiation between the past and present, and to intersect with lives and everyday stories caught in between forces pushing and pulling to shift or reset imposed cartographies. The core of this road trip project will be to reimagine what we know of a place from a distance (distance created both by historical and geographical remoteness) through what we encounter by being present. Here, the artists hope to encounter and engage with actors of internal migration between countries of the region; agents of border transactions and control, players, and victims of regional conflicts, as well as those whose activities serve as a catalyst for infrastructural and economic development for which Africa is considered “the future”. Much has been said (and is still said) about the optimism of Africa’s future. However, the Trans-African Road Trip project is premised on the view that there is no foresight without a hindsight. We go into this road trip wearing two faces: one at the back, turned to history, and the other in front overlooking a possible future as our feet ground our bodies in an ever-shifting present. By such positioning, the artists become proactive agents whose agency is conferred not by what they are named, but by the rigorous experiential process in the re-imagination of their own realities. They become their own stories rather than that which is told of them. The artists will travel from Lagos to Maputo on routes cutting through Nigeria, Cameroon, Central African Republic, Democratic Republic of Congo, Rwanda, Uganda, Zambia, Zimbabwe, and Mozambique. The trip is divided into two stages and therefore two groups of participants: Group A will journey from Lagos to Kampala. Group B will complete the journey from Kampala to Maputo. All together there will be 21 participants: 3 administrators, 9 Trans-border participants and 9 guest participants. Participants will include photographers, writers, filmmakers, historians, as well as (guest participants) architects, dancers, performance artists, and graffiti artists selected through an open call from Africa and the Diaspora. Participants will travel together in one vehicle, all the while, living, working and interacting with each other. The vehicle-space will be equipped to also function as a moving studio for discussions and review of works created while on the road. Participants are expected to develop concrete bodies of work in form of photography, essays, short/feature length films, documented performances and site-specific interventions. Works created by the artists are expected to be personal reflections of direct encounters with locals, indigenes, residents and key actors of contemporary events in places visited. How does this converse, first, with the experience of the artist, and second, the known history of a given place? The process of encounters and work done on the road trip will be shared online on the go and on a daily basis via a dedicated Multilingual blog-app of four languages: English, French, Portuguese and Swahili. See example from our 2014 Road Trip: http://app.invisibleborders.com/. A book articulating the photographic works as well as essays shall be published at the end of the project in conjunction with a feature-length documentary film. The artists will travel across routes cutting through Nigeria, Cameroon, Central African Republic, Democratic Republic of Congo, Rwanda, Uganda, Zambia, Zimbabwe, and Mozambique. While there is no compulsory theme to be explored beyond the road as a metaphor, there are myriad themes of interests – mostly grounded in known history – which has guided our research in identifying stops in cities, towns and villages. For instance, we have placed emphasis on border towns in a bid to spend ample time in exploring stories of those whose everyday lives animate the borders. In the same vein, we have chosen our routes to follow three of the great rivers of Africa – Niger, Congo and Zambezi – for their historical importance in the exploitation/exploration and formation of borders between countries. As such we shall make tangible stops in towns and cities bordering these rivers. Another guiding element is the Trans-African highways connecting the continent. As the Road Trip takes the Trans-African highways as a metaphor, we have given preference to towns that allow for stops on the highways along our trajectory. The millage for the entire journey is approximately 11,000km. The participating artists will be mainly photographers, writers, historians and filmmakers selected from different countries of the African continent and African Diaspora. There will be two stages of the road trip and therefore two batches of participants. The first batch of participants will journey from Lagos to Kampala, while the second batch will conclude the trip from Kampala to Maputo. There will be 5 artists and two administrators (a project manager and a driver) for each batch. Altogether, there will be 9 artists and three administrators who will travel across borders in different stages between Lagos and Maputo. In addition, there will be one guest participant-artist from each of the countries to be traversed. The guest artist will only travel and work with the rest of the participants within his or her own country. With the guest participation, we expand the medium to incorporate architecture, graffiti art, performance art and dance. The invisible border, as we have come to understand it, is the distance between preconceived notions and freshly acquired perceptions, be it of a person or place. Invariably, the idea of the project is to enter, explore and consciously reflect on whatever the road within this distance offers. Thus, the focus of the artists while on the road will be to make everyday encounters with peoples along their trajectory. Here, what is of utmost importance is to intersect with the everyday stories of the people in the places visited. The work produced by the artists are reflections on these everyday encounters in relation to the known history of a place. The artist is not bound by any thematic preference beyond that which the artists chose to explore in relation to any given encounter. These encounters also take the form of collaborations with local artists, students, lecturers and local public as collaborative workshops, exhibitions in public spaces, presentation in schools and universities, etc. Most of such events are planned ahead of time before take off, but a good number of them are improvised in relation to the realities on the ground. Sharing of process on the go. The Invisible Borders Road Trip, as a performative project, places emphasis on immediacy and process. The actual project takes place while the artists are on the road. Whatever comes out of that are considered precipitates of reflections by the artists engaged in the project. Thus, while on the go, the artists share their work-process first in selected contexts (public space, art institutions, centres of learning, workshops with local artists and guest participants, etc), and then virtually through a dedicated blog app. Through the blog-app and the project’s social media platform, peoples from different locations and works of life follow and engage with the project remotely. Since the inception of the Invisible Borders Road Trips in 2009, the internet has been employed as a tool for demystifying the idea of an inaccessible Africa, lost in the middle of nowhere.